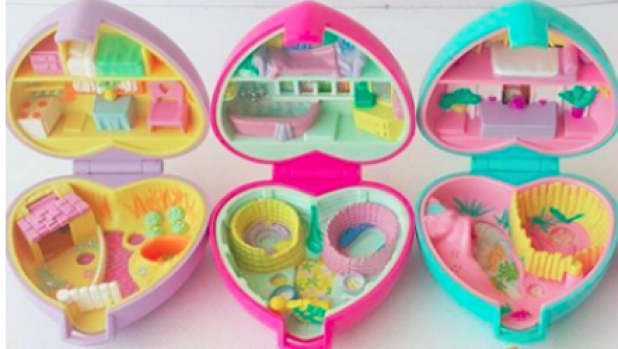 Last month, children of the 80s and 90s were madly rummaging through their attics in search of old Polly Pockets after word hit that they were selling for hundreds of dollars on eBay. But for every person keen to make a buck from the pastel coloured tiny worlds, was a die-hard Polly fan saying "No way am I ever parting with my collection!" Well, this news is for you guys (and your kids, of course). According to BuzzFeed, Polly Pocket has announced that they're re-launching the beloved compacts, with an updated look but a retro feel. "More than 30 years since the launch, Mattel announces the relaunch of Polly Pocket in the original micro-scale and compacts that made her a 90's phenomenon," a Mattel rep told Parents.com. "The all new product line is accompanied with an animated series to introduce a new generation to the world of Polly to amplify her story for modern fans. With more than 10 million compacts sold throughout the years, the compact product line nods to the brand's heritage and surprise factor, but reflects an updated look of the characters and scenes from the content." According to Mattel, the toy launch will be supported by a marketing campaign with "Polly inspiring girls to be capable, courageous and tenacious in their own lives, just like her." The relaunch is particularly exciting given the enduring popularity of the vintage compacts, made before Mattel took over the brand from Bluebird Toys in 1998, which are fetching the most money online. The new range features bright colours (stepping away from the softer pastels of yesteryear) and a return to the smaller designs - although they're not quite as intricate as the originals. But while many are thrilled to be able to share the brand new worlds, including a deep sea adventure, a snow globe and a concert stage, with the next generation, not everyone is loving the new look. In fact, a number of disgruntled Polly Pocket Purists, have taken to social media with the hashtags #bringbackourpollys and #uglypollypocket2018, complaining about its Lego-like appearance and lack of creativity. "We want pastel colours and not this kind of cheap counterfeit colours and designs," one woman posted on Instagram. "I have more than one hundred Polly Pocket play sets but, as a collector, you won't have my money." Whether or not they're ugly will be up to the people to decide when the compacts are released in the US, come June. As for Australia, a release date has yet to be made public - but watch this space.